Four years ago, the Yellow Jacket Sports Network launched a campaign to help raise public awareness that the officials at Greer High School already knew all to well. Dooley Field, once a crown jewel of high school football stadiums, had fallen far behind almost every Greenville County school. Even though the citizens of Greer originally paid for the construction and the County had built or refurbished the others, Greer was stuck with a stadium that was long past adequate. Many things, including the lack of a visitor locker room anywhere near their side, and a antiquated sound system were almost embarrasing for a football program with as much tradition as Greer. The increased publicity from a radio broadcast that attracts over 22,000 listeners on the radio, another 4000 on a web broadcast, and articles on this web site: which will reach 300,000 hits this football season, brought school board hearings and Greer residents making their case. The Greer Citizen started carrying the banner as well. School Board Trustee Pat Sudduth began talking to fellow trustees about equity and fairness. With this opening the school administration at Greer High siezed the opportunity. Led by it's Principal, Mr. Marion Waters, they did an outstanding job of not only being awarded funds, but following through the project to completion & reality. Sure it took longer than many people think it should have, but Thursday night the time has finally arrived. 23 year old Dooley Field will once again take it's place as one of high school footballs best venues. The first thing fans will notice is the additional 1200 seats on the home side, bringing the permanent seating capacity to about 5200. Many big games in the past have attracted crowds of 7000 or more. There are new restrooms. There is a new field house at the Village Drive end of the field. Both teams will now have a sheltered place to go before the games and at halftime. There are new, more secure ticket booths. There is additional lighting and a traffic circle behind the home stands that should greatly increase safety as handicapped and elderly are dropped off. With the new restrooms, the old ones have created much needed storage rooms. The stadium is now much friendlier to those with handicaps. In addtion to the traffic circle, there are access ramps on both sides of the home stands and two handicapped seating areas. New fencing and landscaping is still in progress. The Booster Club and the citizens fo Greer, with the help of local businesses, have pitched in as well with a state of the art $185,000 scoreboard and sound system. There are more things to do. Some are in the works now and will be done over the next few weeks. Others will be done as funds can be raised by, yes, the good citizens of Greer. As they always have, we are sure they will again! The Yellow Jacket Sports Network will always stand ready to "get the word out" to you all in ways you can help. If you see Mr. Waters around, shake his hand and tell him "Thank you!" He will be kind an say that many people have made this happen. He is right. It has been a team effort and new people come alongside weekly to help. Travis Perry has been at the stadium more than he has been at home the last several weeks. But the bottom line is that in spite of the many tireless things that many people have done, if it were not for Mr. Marion Waters, we would not be cutting the ribbons on this project on Thursday night. So from the YJSN....thank you Coach Waters! Please come out and fill the new and improved Dooley Field as the Greer Yellow Jackets take the field for their 2009 home schedule! Once a crown jewel, primarily built with private funds, is in need of many upgrades. There are only two schools in Greenville County that the district has never built a football stadium for? One of them is Greer High. One of them is Greenville High. 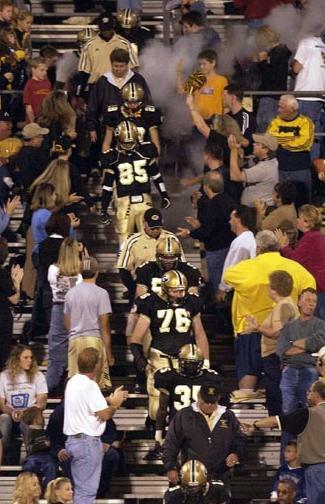 For many years, Greer, the team with more playoff games than any other school in the County, played in the old Greer High Stadium downtown, now called City Stadium, and with the loss of playoff games because there weren't enough seats, concerned Greer Jacket Backers launched a successful campaign to build Dooley Field. When it opened more than 20 years ago, it was one of the nicest stadiums in the Upstate. But even with a parade of volunteers who keep it neat & clean, it's not even close to what other schools in the district have. *Many big games leave thousands without seats, left to sit on a steep, rocky bank, or lined arouund a chain link fence with poor visibilty. *Although the Commission of Public Works was gracious enough to build a locker room in the base of the water tower, pressures about security arising from 9/11 will eventually force the Jackets away from the tower. There is not much in terms of facilites in there anyway, and it's a time consuming walk to & from at halftime. A new field house is badly needed. Along that line, there's not even a locker room or even an adequate place for visiting teams to gather for shelter or at halftime. A simple metal room, perhaps with a bathroom under the visiting stands would suffice. Our guests at Dooley Field deserve that courtesy. *Crowds of 10,000 or more have visited Dooley Field in the last few years, and with Greer's population rising faster that any city in the state, are two restrooms enough? *The Leland Burch Press is extremely crowded on Friday nights & it is beginning to creak. There have been leaks as well. Four small rooms are not simply enough for clock operators, the P.A. announcer & his spotters, Two sets of coaches, two film crews, our radio crew, usually a visiting radio crew & sometimes a TV crew. Besides those essentials, there are also newspaper writers, photograpers, statisticians, and special guests in the Box. A program like Greer needs twice the space it has. *Dooley Field has an area under the home side stands that is quite frankly, SCARY. During home games, under the stands, it's dark. The terrain in unstable there too. Many parents will not let their kids go to the concession stands or the restrooms during the game without adult supervision for fear of passing through this area. A little earth moving, some cement & some bright lights could not only make this a safe place, but it could serve as a shelter during cold or rainy nights. It could be a gathering place before games & at halftime for people to talk & enjoy refreshments. This "concourse" could have historical Greer photos & images that honor Greer High Football history & accomplishments. *The sound system consists of four small metal speakers attached to the four cement light poles. On many occasions only 2 or 3 of the four put out any sound. When the volume is turned up, they produce a crackly unbalanced, annoying sound. When you turn it down, it's not loud enough. Voices sound tolerable, but with any kind of music coming through, the sound is unsatisfactory. *Some schools do not travel well. Some schools bring lots of fans with them. When the Jackets face Byrnes, or Clinton, or Union, Blue Ridge, Greenville, and many other fine programs, there are not even close to enough room for our visiting fans to have a seat. One former Greer coach once said that he could not schedule some big AAAA teams early in the season because they didn't want to come to Greer because we didn't have enough seats for their fans. *We do have an adequate scoreboard. It has a clock, and you can look at it & see the score of the game. But is it a scoreboard that is reflective of a program with the history of excellence that Greer has? *Greer is one of few stadiums that has 25 second play clocks. Over the past several years, a large percentage of the time they don't work. You might say that is not an advantage or a disadvantage, but if our team prepares for a game knowing that they are there, and then they don't work, you could make the case that hurts our team. *There are many, many places in & around Dooley Field that just need some general refurbishing. New paint, grass on the banks, sprinkler system upgrade, more storage, either another or a bigger concession stand on the home side. *Our handicap seating is very poor. There is good access, but a handicapped person must sit in the isle between the upper & lower stands. These areas have a lot of traffic and it's not very much fun to watch a game when people are constantly walking in front of you. Some fans park themselves in the isle & lean over the rail, completely blocking some handicapped or elderly fans who must sit on that first row of the upper section. *Some of the top programs have begun selling "PSL's", or permanent seats. A fan is allowed to pay a fee for a nice, permanent seat. That fan then always owns that seat, as long as they continue to buy season tickets. This feature not only produces much needed revenues for football & other sports, but a long standing relationship between the PSL buyer & the school. Dooley Field is not exactly falling down, but it has lagged way behind funding for many Greenville County school stadiums. Riverside & Wade Hampton in the last years have gone from having poor facilities to among the best anywhere. JL Mann, Berea, Eastside, Travelers Rest, and Woodmont have had District funded impressive stadium projects either completed or nearing completion, while Greer remains empty handed. A school with Greer's heritage & tradition deserves better. When asked, District officials have commented about "all the money being spent in the County", and how it is "tough to find the money for a Greer stadium project". It is the opinion of this web site that beacuse of that very reason Greer should recieve it's fair share. Greer High does NOT deserve BETTER funding for a stadium that other County schools. But it does deserve something it's never gotten. IT'S FAIR SHARE. The Yellow Jackets don't deserve the very best stadium ammenties above all the other schools, but we do deserve equal consideration. After the funding & construction is completed, it will then be up to the fine volunteers to make it the best & keep it that way over the years. 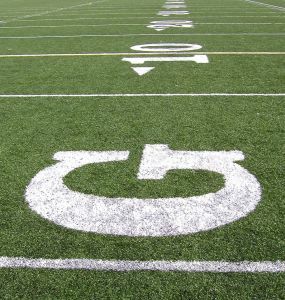 We know that officials at Greer High have done everything required to put the ball in the District's court as to have upgrades be given the green light. To date there has been no action taken to do so. What can you do? You can contact our District 18 School Board member Pat Sudduth. There is no email address listed, but there is a phone number for him by clicking on the above link. You can contact School Board Chairman Chuck Saylors. He has an email adress & phone number. You can email Chuck Saylors right now by CLICKING HERE NOW! For a complete list of Greenville County School Board members, or to visit the district web site, CLICK HERE NOW. Below is a web survey poll created to send to our elected officials. Please take the time to complete (3 minutes) and post any message you might have. Greer folks have always been positive & proactive. Our kids deserve our best & they deserve our voices to be heard. Please take the time to insure that our school gets to compete on a level playing field and that we can have a stadium that we can all be proud of. Below is a link to the message board at SC Pigskin Prep. Someone posted our article on that message board and a fairly lively discussion has ensued. Please understand that yellowjacketsports.net is not responsible for the content of SC Pigskin Prep! Click here.........link to message thread at SC Pigskin Prep! TAKE THE DOOLEY FIELD SURVEY.....CLICK HERE! EVERY GREENVILLE COUNTY SCHOOL ON GREER'S SCHEDULE EITHER HAS A NEW STADIUM OR MAJOR IMPROVEMENTS! O.K. Look at the Greer schedule that we cut & pasted below. Take out Daniel, Byrnes, Clinton & Union and you have left six Greenville County opponents. Five of those have virtually new stadiums to varying degrees,and the sixth, Blue Ridge has new District funded seats. WHY IS GREER CONTINUALLY OVERLOOKED??? When you hear the excuses and the logic that "the money is not there", or "it's coming, we don't know when, but it's coming..." none of that holds water for the long ignored people of Greer, who finally tired of waiting 20 years ago & built Dooley Field on their own. With hundreds of millions being tossed around the County for various projects, including MANY stadiums, the Greer Yellow Jackets, their coaches, and their fans deserve their share. WHERE IS OURS???? Every game this year we have had fans without a seat on that steep, rocky bank. Every game this year small children & young girls pass through a dark, dreary area on their way to the concession stand. Our teams, both home & guests have inferior places to meet & prepare. Both the Yellow Jacket Sports Network & now even the Greer High caoches have moved to the top of the Leland Burch Press Box due to overcrowded, inadequate facilities. WHERE IS OURS???? I was once again embarrassed that the visiting team had to go sit in the end zone at halftime because we have no place for them at Dooley Field. 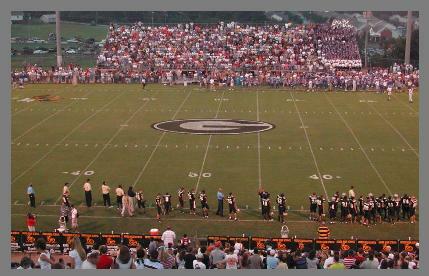 Greer has more playoff games than any school in the history of Greenville County & the best fan support in the County. SO WHERE IS OURS???? LOOK AT THE GREENVILLE COUNTY SCHOOLS BELOW ON OUR SCHEDULE. ALL HAVE EITHER NEW STADIUMS OR MAJOR UPGRADES. WHERE IS OURS???? Step #1 in the stadium fund.......get the tape from the end of the C-Team game last Thursday & send it in to "America's Funniest Home Videos". After it wins, (and it will) split the $100,000 with JL Mann and presto......$50 K to start! !